Like many newlyweds, Sharon Anne and Shannon Koehler face challenges as they plan their lives together. But unlike many couples, Sharon Anne and Shannon are homeless. They’ve both had bouts with substance addictions and, now clean, are struggling to make ends meet on the limited disability checks that Sharon Anne receives for mental-health issues and the disability checks that Shannon, an Iraq war vet, receives. The couple says that while there is no shortage of beds and meals on Rio Grande Street between 200 and 300 South, it’s also a street choked with hard drugs, violence and mental illness. Instead, the two resort to panhandling, and camping at a location in the mountains that they don’t want to disclose for fear of being caught and cited by city officials. City Weekly conducted an in-depth investigation into life on Rio Grande Street for the February 2013 story “I Know I’m Invisible.” The story examined a block ignored by most Salt Lakers that yearly accounts for hundreds of police responses to fights, drug overdoses, public-intoxication charges and suicide attempts. 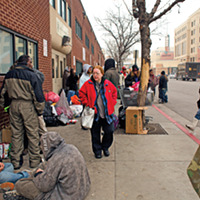 While the have-nots stay close to the Road Home shelter at 210 S. Rio Grande St. and the St. Vincent de Paul Center across the street at 437 W. 200 South for free meals, the street corners in between operate like an open-air drug market where residents can smoke, shoot or snort the vice of their choice. It’s also, not surprisingly, a street that sees dozens of ambulance visits a year for costly calls for service. In our earlier story, City Weekly asked local law enforcement and political leaders what could be done about the problems in the area. We’ve followed up to see what has been done and what conditions on the street have been like since the story ran. In 2012, this half-block saw 63 ambulance visits, 24 calls for police to handle mentally ill individuals, eight suicide attempts, 82 responses to charges of simple assault and 19 charges of aggravated assault. In the first half of 2013, the block has already seen almost as much activity as it did for all of 2012. From Jan. 1 to June 30 this year, the block saw eight responses to suicide attempts, nine calls to respond to mentally ill individuals, 56 calls for response to simple assault and 11 for response to aggravated assault. Ambulances responded to the street 48 times, roughly two-thirds as many visits as there were in all of 2012. Salt Lake City Police Sgt. Michelle Ross, who oversees the department’s Homeless Outreach Services Team (HOST), the unit of the police force with special training to help officers be sensitive to homeless individuals and refer them to services, told City Weekly in January that the department would soon be training all officers citywide to be HOST-certified as a means of improving relations with the homeless community. Not all officers that respond to the shelter area have the training, and the force hopes that improving relations will help prevent serious violence and keep criminal gangs from exploiting the homeless, as well as allow cops to focus on drug pushers rather than people jaywalking and spitting. Ross says that the plan to HOST certify all officers has not been implemented, though she’s hopeful it will happen soon. Enforcement remains difficult on Rio Grande, and relations were recently strained in June, when police officers sought to cite two juveniles for jaywalking. According to a police report, the individuals became combative with police, and law enforcement noted the individuals appeared to be displaying gang colors. The officers employed force in arresting the individuals as they feared they may have been armed. One youth was Tased, and the two were then charged with inciting a riot, as street residents yelled slurs and called out police for what they saw as a heavy-handed response. Ross says most officers she knows don’t issue citations for every offense and will often give warnings, but she says that situations can escalate based on the attitudes of those being cited. “If a person is already agitated and we talk to them and they become more agitated, well, that’s part of the job,” Ross says. “We deal with folks often at the worst possible time in their lives, and we realize that. But not everyone gets a ticket every time we deal with somebody. That’s not the way we do business.” City Weekly also previously reported on how in 2012, a parking lot for the Rio Grande Cafe near the Road Home shelter had seemingly become a ticket trap for the homeless, who would walk across the parking lot and be ticketed for trespassing. In 2012, the Salt Lake City Police Department responded to 189 incidences of trespassing at the parking lot. Mark Stewart, who is not homeless, is a former restaurant server who received a ticket in fall 2012 from a police officer who appeared to be waiting for people to cross the parking lot. Stewart told City Weekly that “police are handing out no-trespassing tickets like candy” to the homeless. For the first half of 2013, however, police have responded to only one call for trespassing on the parking lot. Low-income advocates with the Crossroads Urban Center have for years called on Salt Lake City to help set up a transitional-jobs program that would help the homeless with part-time work, helping them get back on their feet as they relearn job skills and regain work experience that may have been lost due to long periods of joblessness or addiction. Salt Lake City Council Chair Kyle LaMalfa says the city put $80,000 toward a transitional-jobs program in its latest budget proposal in early June. Art Raymond, spokesman for Mayor Ralph Becker, told City Weekly in January that Becker was hoping to collaborate on homeless services with municipal leaders in the valley. 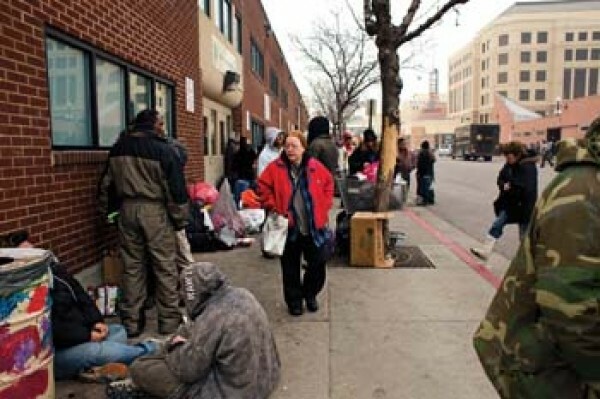 Raymond says Becker recently helped pass a resolution at the council of governments, whereby neighboring cities recognize Salt Lake City shoulders the burden for homeless people who largely come from outside of the capital city. While it’s nonbinding, cities are now exploring making voluntary assessments to help Salt Lake City cover the costs of providing homeless services. While some promises for help have been put on the backburner and others have made progress, for the Koehlers, the shelter area still represents the last place they want to go if they ever hope to stay clean and get off the streets. Hoping to save money to improve their situation, Shannon Koehler says the couple will continue to camp out rather than risk falling into the morass of life on Rio Grande.